DesignCrowd. Best custom graphic, logo & web designs for your business. Get $100 off your design project at designcrowd.com/twist or enter promo code TWIST. Jason “jams out” a number of marketing and growth tips with founders in this special “Jam Session” episode of This Week in Startups. Casey Winters is a growth advisor and was previously Growth Product Lead at Pinterest and GrubHub. He explains how to use landing pages to capture all of the free search traffic that you may be missing out on. Sue Kwon, Head of Communications at Honor, draws parallels from her experience of working in a tv newsroom to what founders go through having to quickly tell their story with little money and time. Then, David McIntosh, CEO and co-founder at Tenor, talks about growth, specifically about making decisions that compound exponentially instead of slow linear growth. 00:42: Jason introduces today’s Jam Session. 03:35: Casey Winters is first up with a slide deck on using landing pages to capture all of the free search traffic that you may be missing out on. 09:53: Break – Thank you, Walker Corporate Law! 11:17: Casey shares additional tips on bldg hierarchy for considering how to create content for landing pages. 16:55: Brian asks Casey: How do you help each startup mine this out? Tactically, do landing pages come out of system itself, or WordPress, Hubspot. etc.? 21:50: Jason asks Casey: Do you use a SEO consulting firm, or do it in-house? How long does it take to learn to build effective pages? 25:04: Break – Thank you, DesignCrowd! 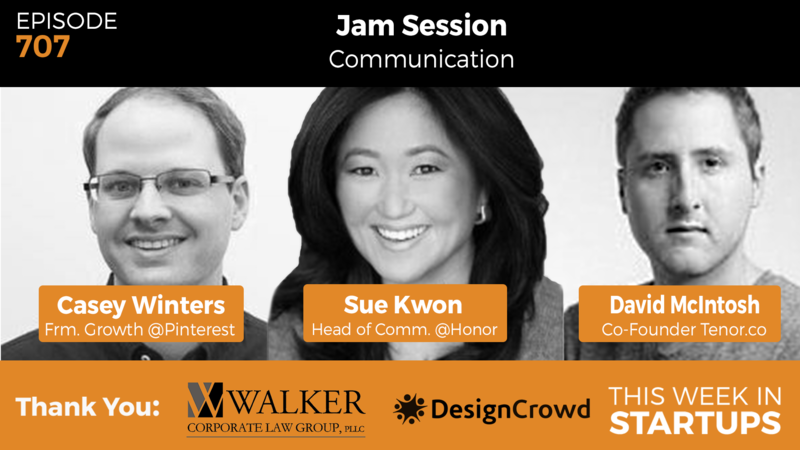 27:21: Sue Kwon, Head of Communications at Honor, talks about how to run your marketing department like a tv newsroom. 48:00: Casey asks Sue: How do you help startups figure out what story to tell about how to stay relevant? 43:54: AirBnB recently launched tours. Jason asks Sue how she would create a marketing effort around this if there were no PR people. 51:15: Jason asks Casey how he would build a landing page for this, with limited resources. 53:11: Sue shares a success story of combining founder story with television. 55:10: David McIntosh, CEO and co-founder of Tenor, shares growth insights from Tenor and how to potentially apply some of these lessons to your business. 56:05: David describes the Growth Framework and the 3 main points around it. 01:01: Jason asks Brian to rank today’s speakers in order of joining Clipisode, and why.